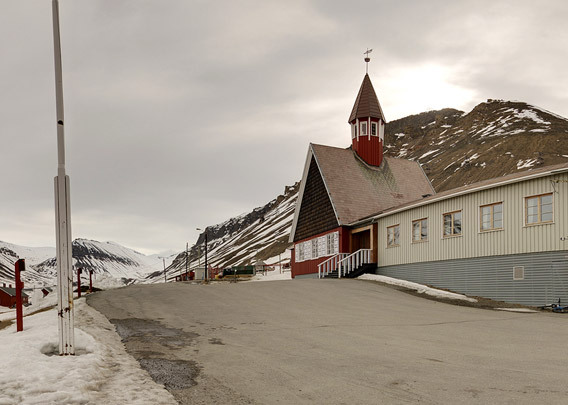 Being a proper settlement, Longyearbyen does of course have a little chirch. Svalbard Kirke is, as the name suggest, not just Longyearbyen’s church, but takes care of all people in Spitsbergen, including those living in the other settlements and stations as well as visitors. There is a chapel in Barentsburg, but no church, so Svalbardkirke is the only church in Spitsbergen. The original church was built within 50 days in 1921 and it was sanctified on 28 August 1921. The Svalbard Kirke is in a nice location, in Skjæringa, the oldest part of Longyearbyen, a bit on her own and with a nice view over Longyeardalen. Longyearbyen was evacuated in 1941. The priest took precious and sanctified items with him to England, so at least they survived when the church was destroyed when Longyearbyen was bombed by a German fleet with the battleships Scharnhorst and Tirpitz in 1943. 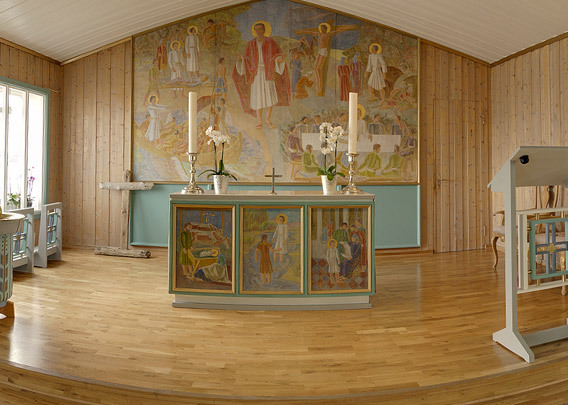 The base for a new church was laid in 1956, but construction work did not really start before 1957 and the new Svalbard Kirke was sanctified in 1958. This is the one that is standing in Longyearbyen today and hopefully for many, many years to come. Everybody is welcome to the church at any time, regardless of belief and religion. The door is never locked (but, just to make sure there are no misunderstandings – the church is not a place to spend the night for free). There will not be many churches in this world who offer services such as a gun safe and a little souvenir shop. 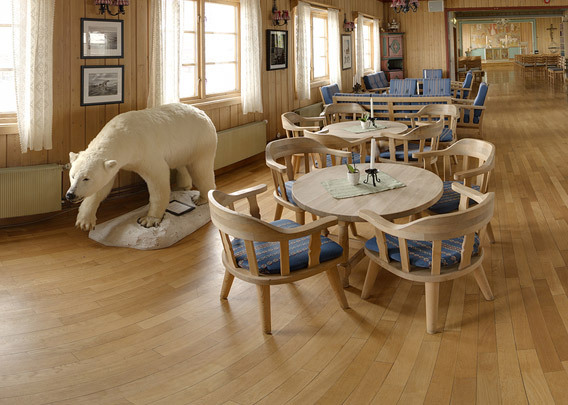 You take your shoes off in the entrance, something that is common in many public buildings in Longyearbyen. You can donate to the collection by credit card, and if you liked your visit, then you can document this on TripAdvisor. Very modern. There are church services on most Sunday mornings at 11 o’clock. These are held in Norwegian, but everybody is explicitely welcome. In addition, there are more or less regular public events such as concerts. Being a modern institution, Svalbardkirke has a webseite where information about events is published. The large main room is not only the nave, but the forward part is used as a “church café” and it is a nice tradition to meet people over a cup of coffee after a church service.